In honor of the upcoming festival of Channukah, Members of the Israel Defense Forces Orchestra, under the baton of Major Noam Inbar, gave a performance in the lobby at Schneider Children’s Medical Center. The orchestra comprised 8 musicians and two singers who cheered the children, families and staff with their renditions of current hits and nostalgia that had everyone tapping away with joy. Dr. Patch Adams visited Schneider Children’s as a guest of Friends of Schneider Children’s while he was in Israel to receive the Danielle Prize for Medicine with a Heart, which encourages humanity in medicine. The Prize is named in memory of Danielle Sonnenfeld z”l, a volunteer in the Hematology-Oncology Department at Schneider Children’s, who was tragically killed in a road accident. 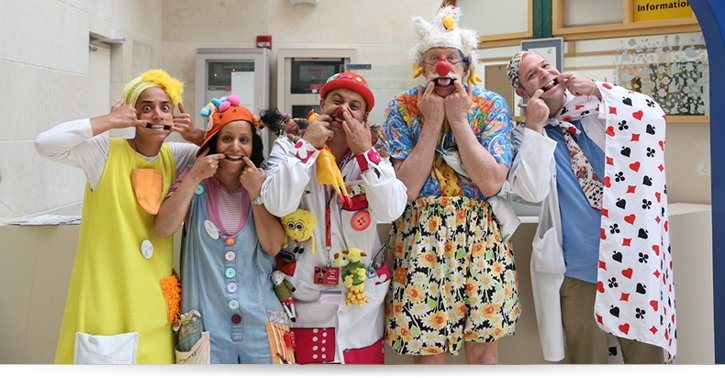 During his visit, Dr. Adams presented a fascinating and humorous lecture to hospital staff, hospital clowns and other professionals from around the country about the importance of laughter, enjoyment and creativity to encourage patients in their recovery and to reduce pain. Patch Adams is a physician, social activist, and changemaker - an agent for change through humor, love and compassion. Adams shares his powerful abilities the world over. A popular movie was made about his life starring Robin Williams. He last visited Schneider Children’s in 2007. Mrs. Netanyahu visited Schneider Children’s during the Channukah Festival, and lit the 5th candle along with hospitalized children and their familie, and hospital staff headed by Prof. Joseph Press, Director of Schneider Children’s, Dr. Avinoam Pirogovsky, Deputy Director, and Prof. Isaac Yaniv, Director of the Hemato-Oncology Department. Members of the Maccabi Tel Aviv Soccer Club visited Schneider Children’s to cheer hospitalized patients during the High Holidays. 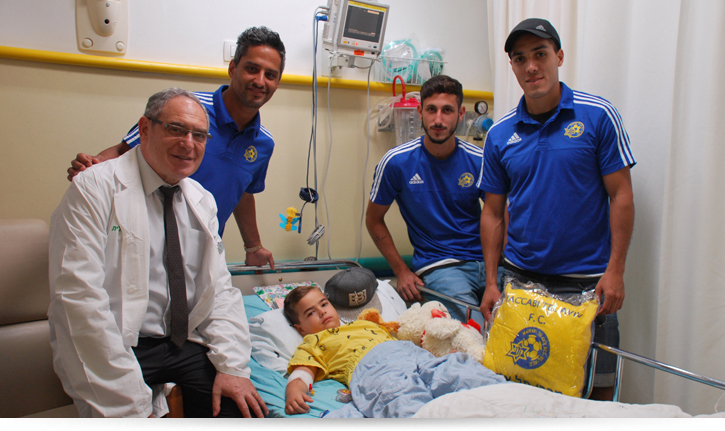 At the initiative of the Maccabi Tel Aviv Soccer Foundation, Barak Yitzhaki, Yuval Shapongin and Oskar Skariona, and Sagiv Yehezkel visited children in the various departments including Oncology, Surgery and Dialysis. The players distributed gift baskets which included a pillow, hat and scarf to the excitement of the children. A group of volunteers from the non-profit ESRA in Modiin visited hospitalized children and distributed scores of beautifully knitted items such as scarves, hats and blankets. 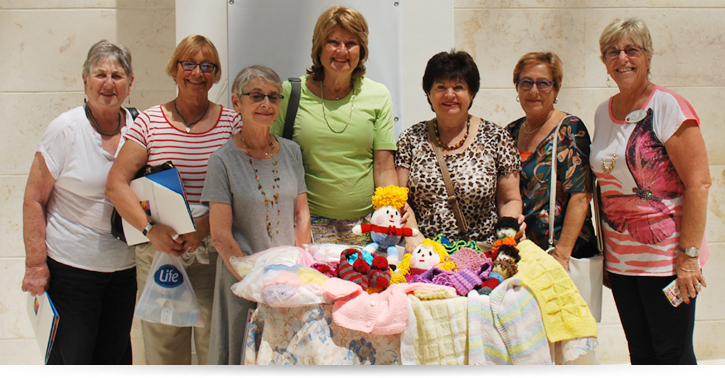 The gifts were crafted by ladies in ESRA Modiin’s Knitting and Crocheting Circle, one of the many volunteering activities of the organization in the city. The creative and colorful items brought smiles of cheer to the children as well as their parents and staff members. The visitors also toured various departments including the Education Department’s White Room, Hemato-Oncology and Neonatology. ESRA – English Speakers Residents Association – was founded in 1979 to provide English speaking immigrants with an opportunity to volunteer within their communities thus enhancing their assimilation, and to establish projects utilizing their mother tongue. ESRA is the largest English-speaking volunteer organization in the country and comprises thousands of volunteers who volunteer in a wide variety of projects and programs to benefit the underprivileged sectors. ESRA Modiin itself supports Neve ESRA, an afternoon care center for 9-12-year-old children at risk. 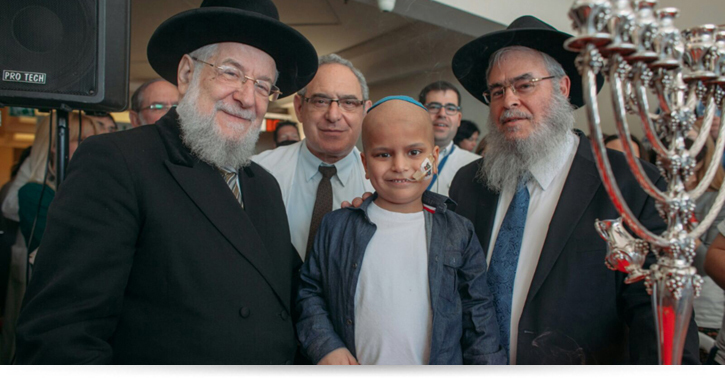 The former Chief Rabbi of Israel, Rabbi Israel Meir Lau, visited Schneider Children’s to light the second Channukah candle together with patients and their families in the Hematology-Oncology department. The event was initiated by the Ezer Mizion charity, which supports the hospital. 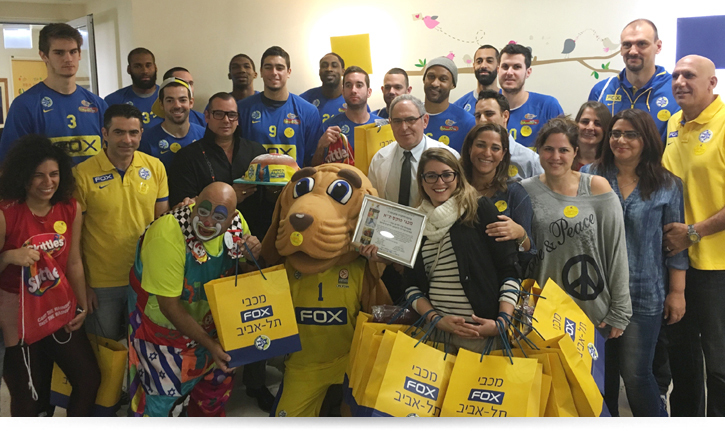 Our Children charitable organization which supports the hospital, hosted the players of the Maccabi Fox Tel Aviv Basketball team when they paid their annual traditional visit to the hospital during the Channukah Festival. The players distributed gifts and sweets to the children and their families and happily agreed to be photographed with them. The visit of the "Maccabees" generated, as it does every year, great excitement among the children and their parents as well as among the medical staff. Prof. Joseph Press, Director of Schneider Children's, accompanied the team members during their visit to the Oncology Department and thanked them for their heartwarming tradition of visiting children in the hospital every year. Ms. Maka Chichua, wife of the president of Georgia, Giorgi Margvelashvili, was welcomed by Prof. Joseph Press, Director of Schneider Children’s, and members of hospital management. Together with her party, she also toured the Institute for Day Care Hospitalization. Following the visit, Ms. Chichua indicated her intention to investigate the possibility of collaboration with Schneider Children’s to strengthen the field of Child Development in Georgia. As an advanced medical center with broad international ties in many countries around the world, Schneider Children’s regularly hosts guests from abroad. Over recent years, distinguished visitors included the US Ambassador to Israel, the Governor of the Nyandarua County in Kenya and the Health Minister from Macedonia. 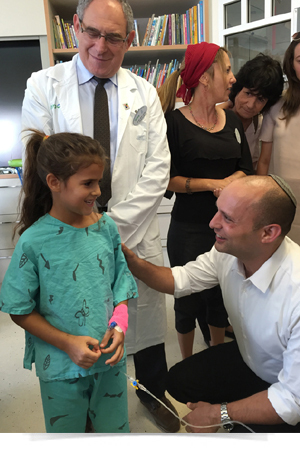 On September 1, 2015, Minister of Education Naftali Bennett visited Schneider Children’s to mark the start of the school year with hospitalized children. Accompanying the Minister were Irit Livne, Supervisor of Health in the Ministry of Education, and Itzik Braverman, Mayor of Petach Tikvah. The guests met with Prof. Joseph Press, Director of Schneider Children’s, and Maskit Shochat, Director of the Educational Center. Following his visit, Minister Bennett said that “this was without a doubt the most important place I have been to today, the first day of the new school year. I met children with endless optimism, who don’t give up, and with dedicated staff who perform holy work. It is said that ‘whomever saves one life is as if he has saved an entire nation’. You save so many lives both medically and educationally. I wish everyone a successful and healthy academic year.” The Educational Center at Schneider Children’s is an experimental school operating under the aegis of the Ministry of Education and provides continued education for the hospitalized child while supporting the hospitalization process and advancing recovery. Children from the youth movement “Noar La’Tet” (lit. youth who give) from Kfar Kassem visited at the initiative of staff social worker Aruah Faridge. 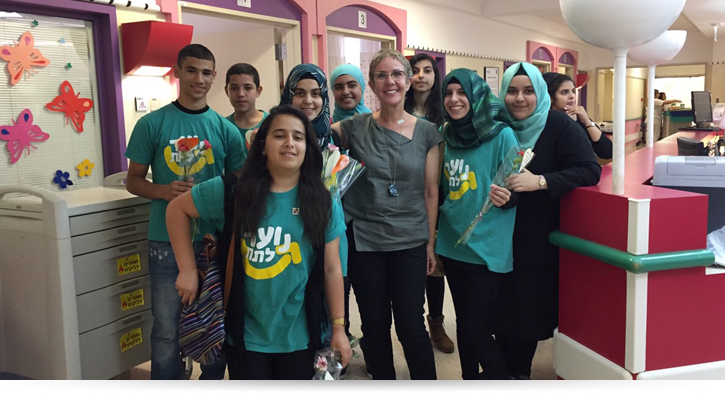 Prior to their visit, the youngsters organized a special bazaar in their school in Kfar Kassem together with their counselor, Rena Sarsur. The proceeds were contributed to Friends of Schneider Children’s. During their visit, the youngsters toured various departments in the hospital and heard explanations from the staff about activities and also met some hospitalized patients and their parents from Arab communities. “Noar La’Tet” aims to instill values of volunteerism, social solidarity and mutual exchange and compassion, in addition to promoting leadership and encouraging social initiative to improve society. The youngster’s involvement in building initiative and participating in volunteering helps them to forge a stronger society while influencing the image of Israeli youth. 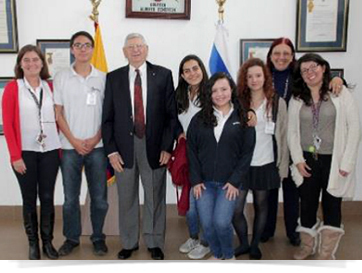 Students at the Albert Einstein School in Quito, Ecuador, were honored to meet Israel Prize laureate, Prof. Zvi Laron. The visit was arranged by Tel Aviv University representative in Ecuador and school head, Raquel Katzkowicz. Prof. Laron, Professor Emeritus of Pediatric Endocrinology at Tel Aviv University and Director of the Endocrinology & Diabetes Research Unit at Schneider Children's, is best known for his discovery of Laron syndrome, a form of dwarfism that is caused by lack of absorption of the growth hormone in cell receptors. Approximately one-fifth of sufferers reside in Ecuador's Loja region. Prof. Laron answered many questions posed by the enthusiastic students during an interactive lecture. "It is an exceptional opportunity to meet someone who is so knowledgeable and wise, and an honor to have him here in Ecuador and in our school," said Isabel Machado, one of the 11th grade students who took a keen interest in Prof. Laron's research. The US Ambassador to Israel, Mr. Dan Shapiro, visited Schneider Children’s in honor of the Festival of Channukah together with a delegation of embassy staff. 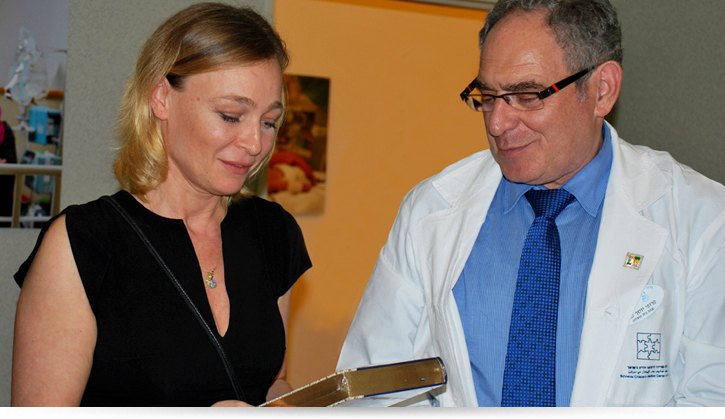 Dr. Efrat Baron-Harlev, Deputy Director of Schneider Children’s, hosted the distinguished guests who arranged a special happening for hospitalized children. They operated creative corners and food stands, and also distributed gifts to the children. This is the third consecutive year that staff at the US Embassy has visited the hospital during Channukah. The Ambassador’s visit underscored the cooperation existing between Schneider Children’s and medical centers in the USA, as well as with pediatric institutions all over the world, which place the hospital on the cutting edge of medical science and accord the application of advanced global technologies and techniques. As a progressive hospital of international repute, Schneider Children’s regularly welcomes dignitaries. 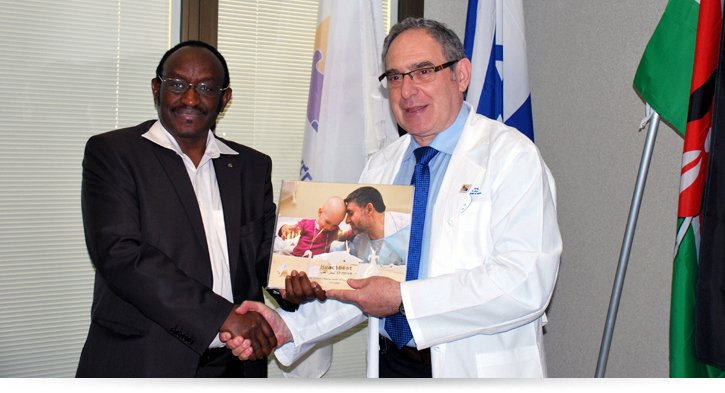 Over recent years, the hospital has hosted Ambassadors in Israel from Ethiopia, Italy and Macedonia, among others. Mr. Daniel Waithaka Mwangi, Governor of the Nyandarua County in Central Kenya, visited Schneider Children’s recently. He and his delegation were welcomed by hospital director, Prof. Joseph Press, and toured various departments, including the Pediatric and Cardiac Intensive Care Units, Neonatology and Surgery. The aim of the visit was to discuss future collaboration, training and professional exchange. Schneider Children’s maintains close links with leading pediatric institutions worldwide through the exchange of specialists, joint conferences and multicenter research. These activities place the hospital on the cutting edge of global medical science and accord the application of the world’s most advanced technologies and therapies. The Petach Tikva Fire Department arranged a unique happening for sick children at Schneider Children’s at the initiative of Dr. Efrat Baron-Harlev, Deputy Director of the hospital, Lilach Yechezkel, Head of the Personal and Welfare Department at the National Firefighting Authority, and Boaz Rakia, uncle of the child, Oriki Levi, z”l, who was in treatment at Schneider Children’s. Yael and Amit Levy, Oriki’s parents, wished to support the hospital in various ways, among them through fun activities for hospitalized children. The visit of firefighters generated much excitement among the children and their families who enjoyed seeing the equipment and climbing on the fire engine. The firefighting team also visited bedridden children in the departments and distributed gifts. Kung Fu Shaolin is a 1500-year-old traditional Chinese method of martial arts based on superb physical ability, self-defence skills, speed, strength, alacrity and power. 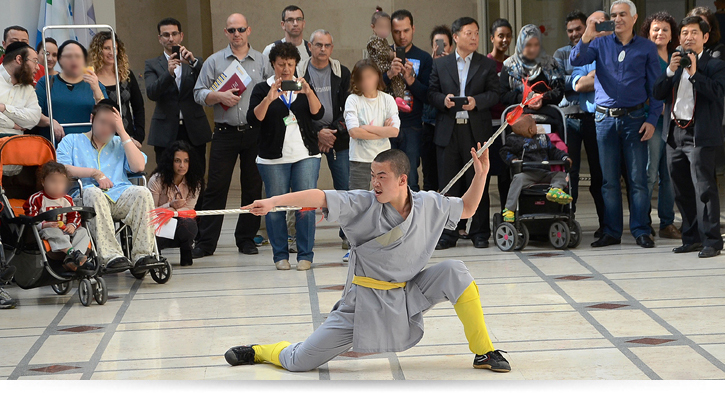 A delegation of “flying” Shaolin monks, guests of the Suzanne Dellal Center in Tel Aviv, gave a mesmerizing performance for hospitalized children at Schneider Children’s as part of the “Spring Chinese Dance Events” taking place in the country. The monks were visiting Israel under the auspices of the Chinese Embassy in Israel and the Chinese Office of Culture. Their performance at Schneider Children’s was arranged by the association of “Our Children”. In cooperation with Friends of Schneider Children’s, Residents of the Em Hamoshavot neighborhood in Petach Tikva visited children in the Hemato-Oncology Department at Schneider Children’s and distributed i-pads. 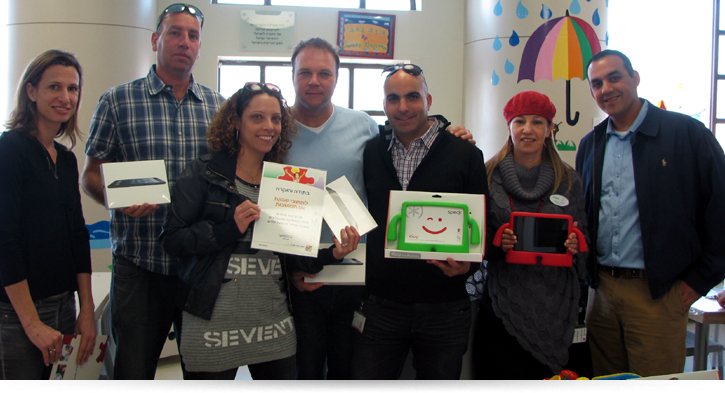 The electronic devices were purchased with funds raised to benefit hospitalized children at an end-of-the-year party in Em Hamoshavot. David Kariv, a representative of the Em Hamoshavot residents, said that“the end-of-the-year party is part of our community activities. From the start, we wanted to donate the proceeds from the event to a worthy cause and I was pleased that we could make a donation to benefit hospitalized children.. Schneider Children’s was a natural choice, and I hope that the efforts on behalf of the hospital will expand so that we can continue our good deeds in the future. Friends of Schneider Chidlren’s is an association of friends that supports the activities of Schneider Children’s since its inception in 1992, and assists in the development and advancement of many fields including the establishment of new units, the acquisition of equipment, special projects and research. The Mayor of Petach Tikva, Adv. 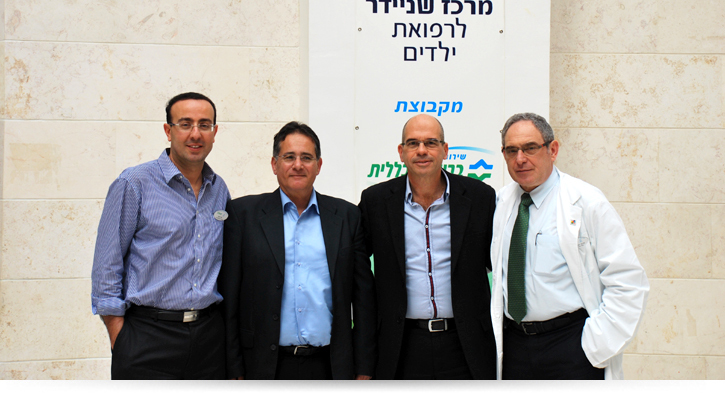 Itzik Braverman, accompanied by the municipality’s CEO, Yaacov Maman, were hosted by hospital director, Prof. Joseph Press, and Administrative Director, Ilan Shemesh. The guests toured various departments including the Hemato-Oncology Department, the Cardiac Intensive Care Unit and the Emergency Medicine Unit (ER), and held discussions regarding the plans for the construction of the new hospital tower. The new building will comprise, inter alia, additional hospitalization departments, outpatient clinics, research labs and more.